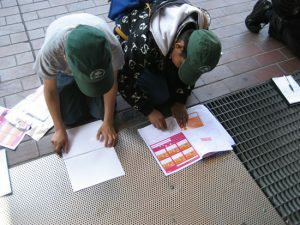 3. to give teachers the knowledge of how to use architecture as a resource for teaching subjects across the curriculum. The scheme essentially pairs architecture practices with a local primary school and a nearby building. We drew Furzedown Primary School in Tooting and the Barbican Centre in Central London. 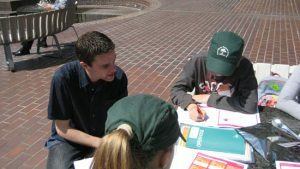 We were delighted, if a little nervous, about the prospect of guiding 30 children aged between eight and nine around the barbican, but it turned out really well. 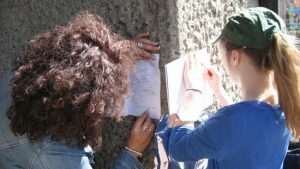 The day onsite took place in June and we set children the task of measuring, sketching and analysing the building and public spaces at the Barbican. Something they seemed to relish in. Despite our nerves, the day went without a hitch. Certainly our team enjoyed it as much as the children. The second phase of the project was to join the children back at their classroom and help them design a new art room for their school. We hoped they would use some ideas from their trip to the Barbican which seemed to work really well. The result was a selection of models, made from cardboard, drinking straws and other craft materials which all looked great. We were proud to see what the children had created. We took a few photos of our day with Furzedown Primary School which you can see below. A lovely day that we’ll certainly want to repeat next year. Thanks to Headteacher at Furzedown Primary School, Monica Kitchlew-Wilson, and everyone else involved in organising this fantastic programme. For more information on Junior Open House visit Open City.